Why I always seem to head to town at about 3:30 p.m. when the traffic is terrible I don’t understand. 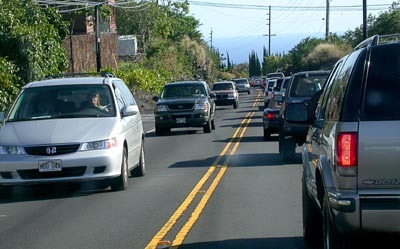 Here traffic is backed-up on Hwy 190 going into Kailua town, this is about four miles from town. I was once told that it’s the result of turning a donkey path into a two laned highway. That may not be too far from the truth. Anyone will tell you that traffic is bad everywhere, but I’m just here to gripe about it where I live. Heck, it’s 3:30pm, don’t these people work? How can they afford all those gas guzzlers? 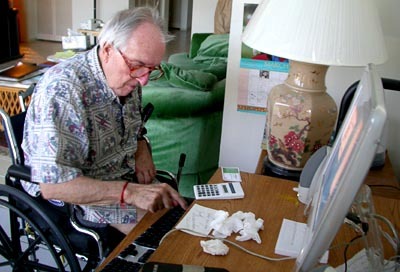 Here’s Gean, typing one-handed while in a chat with his daughters Leilani and Maile. I think bandwidth on the internet is decreasing, now that there are three Cannon’s online. I went back home, through light traffic thank-goodness, and back to town to get a microphone adaptor for the computer. Bought a boom mic for $1 at Salvation Army and gave Gean a set of amplified speakers, brand new. We were in business for some serious internet audio chatting. We finally hooked up with Maile online and it was a wonder to see Gean chatting via voice, sooo much easier than typing. So now they can audio chat. Me stuck in traffic once again but what a view. You could almost see every tree on Mt. 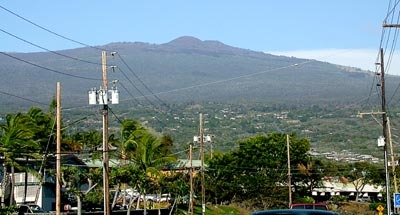 Hualalai, a very clear afterhoon. The cinema. Saw Eternal Sunshine of the Spotless Mind, very good movie. Jim Carrey shows some nice range in this, kind of reminds me of how Robin Williams was pidgeon-holed into comedy roles until he did some good dramatic work. I must admit that Tall Andrea and I missed at least the first five minutes, hey it’s not like it was Betty Blue or maybe it was as I missed the opening, since I was trying to get Gean’s Mac squared away and lost track of time before heading for the theater, with an on-time Andrea waiting outside. El-Ron and Jim were supposedly wanting to go to the movies too but they wanted to see Starsky & Hutch…I mean really, the 70s? Platform shoes? The Bee Gees? A Grand Torino as a muscle car? They passed on this movie, now if Jesus Christ was driving a black Trans-Am that answered to the name ‘Kit’ we might have seen another movie together, but I don’t think Mel filmed it that way. After the movie we had to make a decision…where to eat in Kona at 9:45 p.m. It looked pretty bleak, Tacos El Unico closes in 15 minutes and Denny’s wasn’t sounding too appealing. We found a new place next to the theater, which also stopped cooking in 15 minutes, called Peaberry & Gelettes. The peaberry refers to the somewhat rare pea-shaped coffee beans that supposedly make really good coffee. Gelettes refers to the buckwheat waffles they make and they also make stuffed crepes. I got the spinach, cheese, mushroom and ham crepe which was very good (kind of expensive, about $9.50). I’d recommend it if you want something different to eat, it had that yuppie atmosphere in there which may be a plus or minus according to how you feel about that sort of thing. And finally, I did have an espresso there which cost me over two bucks for a small cup. Seeing all those tins of Illy coffee there I couldn’t help but think about my own Illy tins at home when I make my own espresso for a fraction of the price, in real chinaware. I’m fading fast and need to get to sleep. Sorry this post wasn’t more interesting, isn’t that a theme everywhere recently? But it’s all I can do at the moment as my eyes are shutting down on me. Good night.